Picture: the solid tower of the Saint-Quentin's church of Oostkerke . 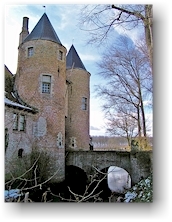 We have a first reference of a stronghold in Oostkerke (a stone donjon) around the year 1300. A real court is not mentioned until 1358 and the oldest parts of the current castle are a remainder of the 14th century fortification. At that time it consisted of a upper court and a lower court that were both surrounded by a ditch and a wall, additionally protected by round towers on the corners. This can still be clearly seen in the garden of the castle. 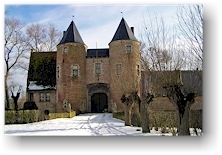 The living quarters for the lords of Oostkerke were located in the upper court (no longer existing). On the lower court, on the spot where we can see the current residence, were amongst other things a farm and a dovecote. Since the 16th century, the castle had a lot to endure: occupations, pillages and arsonism. At the end of WWII, the region was flooded, completely ruining the gardens of the chateau. Furthermore, the German occupators removed the woodwork from the castle which seriously weakened the structure of the building, that was in the meantime not much more than a ruin. 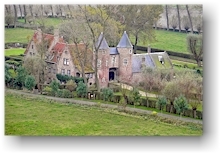 The property was bought by baron van der Elst just before the Second World War. He had the castle thoroughly renovated. The result of this renovation can be admired today. A bridge over the ditch and two impressive 14th century round towers give access to the domain. Behind the gateway lies according to some on of the most beautiful gardens of the province. Afther the flooding in WWII, baron van der Elst asked landscape architect Mien Ruys to redesign the garden. This garden consists of several separated gardens such as an enclosed innergarden, a maria garden and a rosary. The overall combines perfectly with the surrounding meadows. During the shaping of the garden, the foundations of the medieval castle were found. These foundations have been incoporated in the garden as footpaths. The domain is private property and not accessible to the public.